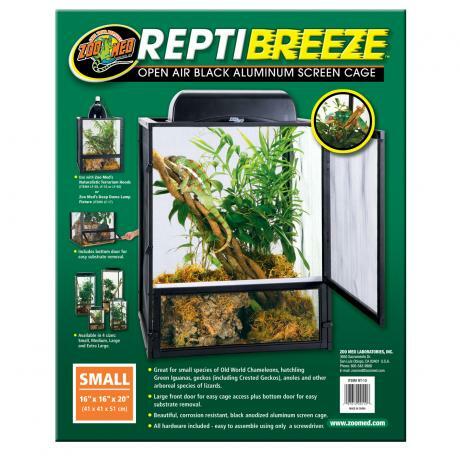 The ReptiBreeze Screen Enclosures are ideal for a number of species that require a good air circulation such as; Chameleons, Anoles, arboreal Geckos etc. Lighting can be placed on top of the enclosure with the Zoo Med Deep Dome. Each enclosure has a large front door with a smaller one at the bottom to access substrate. Zoo Med have designed one for larger species such as young Green Iguanas, Water Dragons and Large Chameleons. This ReptiBreeze Iguanarium has plastic coated wire to help prevent nose rubbing. Large front and top opening doors for easy animal access with a removable bottom tray for cleaning. This also comes with four casters (wheels) to move the cage outside for natural filtered sunlight. Removable "basking" shelf included. The enclosure are flat packed and easy to assemble, needing just a screw driver.